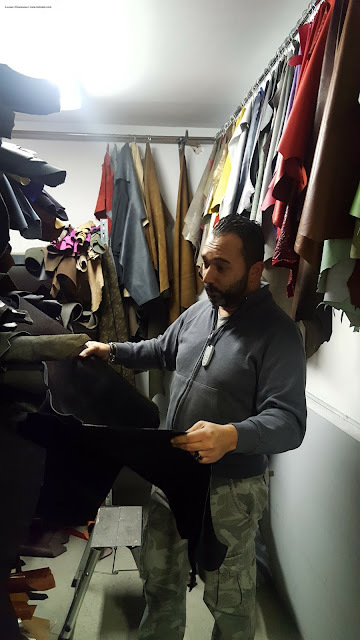 People say that the Via Carlo Alberto shoe repair can actually fix everything made in leather, especially shoes, belts, bags and wallets. 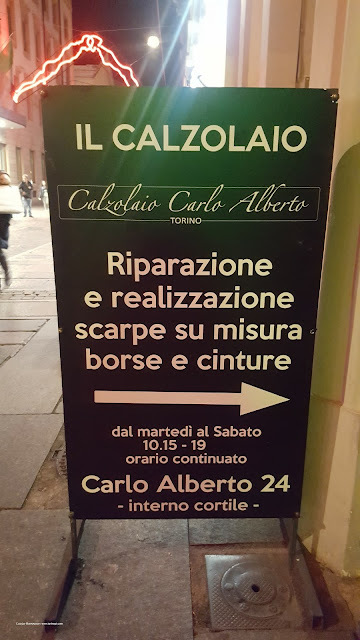 Apparently, many high end shops know about this guy and his title and address are spreading fast all over Turin. 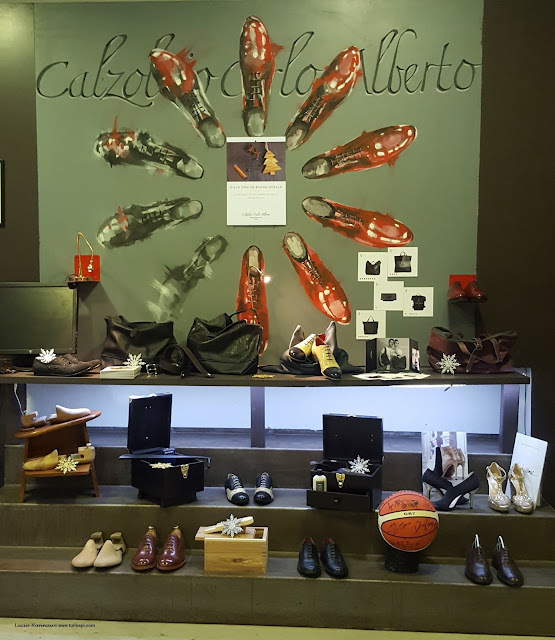 We also got to know about him through our friend, Turin indie fashion designer and fashion historian Adriana Delfino who mentioned him as an old-fashioned artisan. So, we looked for his Via Carlo Alberto shop and found him! 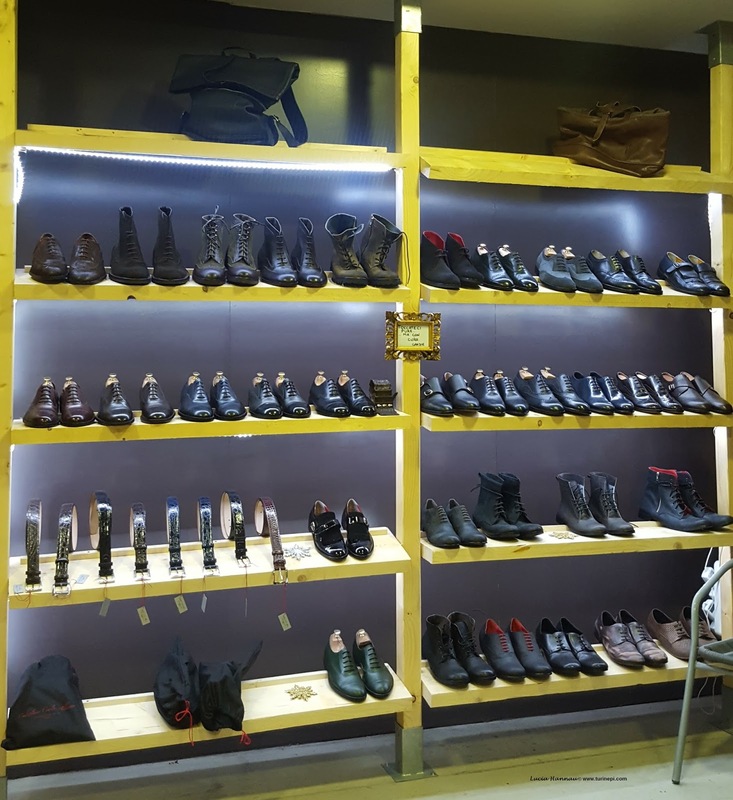 The shoe artisan is Beppe Rondinella and besides fixing everything made in leather, he has a passion for men's shoes. Everybody knows women's shoes are a fetish and play a pivotal role in our lives... well, now you know it: men's shoes are as equally important in the Italian culture. In fact, it's no secret Italians pay a lot of attention to their fashion details and materials quality; it is part of that local flair you can acquire but it runs in the natives' blood, effortlessly, like a second skin. custom-made shoes as well as repairs! The universal fixer and shoemaker shop is inside a palazzo courtyard, behind an iron gate. It's rather easy to find him actually because of the big sign in front of the main palazzo door. Adriana didn't tell us what exactly Beppe does for a living. She simply said "he works the leather and makes custom made shoes and belts" which to us was enough. However, as we got inside his shop, we only saw men's shoes and two pairs of Manuela Gomez's women's shoes. I make only men's shoes because I want to fully enjoy my crafting moments - Beppe told us quickly and right away. As a man, I know what looks good on a man and I just deeply love my job. This sentence will easily resonate with any artist and as we are creative minds, we got on his same wavelength right away. Beppe started in 1991, he learned from a shoe maestro how to visualize shoes and then craft them. His professional goal is to make shoes that cradle our feet. Even more comfortable than slippers! Shoes are my passion because in a shoe there is everything! - in Italian culture everything we wear portrays our personality like an extension of our self. This is why Italians traditionally tend to invest a lot in their clothes and accessories, paying extra attention to details. And shoes, much more than other things we wear, say a lot about our lives and natures. Our good traits, flaws, everything is in our shoes. I always look at people's shoes and have fun imagining their lives. So, out curiosity, thinking about all the people who can't stand their industrial shoes and kick them out the minute they get home and go barefoot as much as they can, we asked him about socks. Italians are particular sensitive about the sock topic, especially when we are talking about men. It's not a mere question of limiting the white sock to the gym, but of real combination of fabrics and designs. Yes, then again, we are in Italy, look is vital for both social and professional success. Absolutely! Socks are as important as shoes and I am thinking of selling them too! Seeing Manuela's shoes we inquired about women's shoes... I only make them for my wife. It's my present to her and I make her heels! Even though she wears 41 (9.5 US), her size isn't Beppe's problem since he has all the models. And lucky woman, she has about 150 custom made pairs!! I am not interested in money and getting rich, I'm more interested in living and dying satisfied and happy. Rather than making women's shoes, I would change job. It's just not my call. Beppe and his wife have 3 sons, in fact, he also made baby shoes for his kids: teeny tiny shoes sized 22 (6), 29 (11.5) and 32 (1) that were passed on to his nephews. 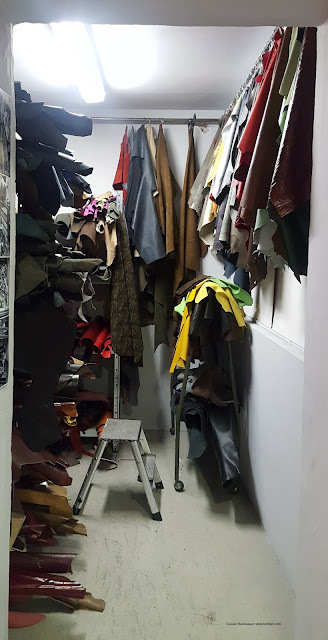 His shop has a room full of leather supplies of different color, size and thickness; some are shiny, others are matte. There is also all the equipment he needs to work: the wooden models and the machines. Beppe's key words are punctuality and professionalism: he strives to give the best of himself, always with a keen eye for the detail. But... he says he is very blunt and doesn't sugarcoat his opinions: if he thinks a customer's pair of shoes to repair is worthless, he will tell him/her and will refuse to fix it. Blunt or not, he's quite sought after! As soon as somebody hears about the Turin's magic shoe repair and shoemaker, they run over to his shop from everywhere. All his non- Italian customers keep him in high esteem for his talent and we are sure pretty much everybody does it too. So when somebody asks for a model he has never made... he'll first try it on himself. He and his wife are the guinea pigs: before accepting an order, Beppe wants to make sure he can make it properly and at the state of the art. Making a man's pair of shoes takes him 23 working hours. He also makes man's shoes for women in 21 working hours and acting as his customers' guinea pig he ended up with his own 50 pairs he wears in his free time. In fact, when Beppe is not working, he likes to change his shoes everyday, like a shirt. Beppe is a real shoe artisan who made his job out of his passion. Working closely with the customers gives him such an energy boost that even when his shop burned down and he lost everything, he got back up again thanks to his customers' affection and shoe orders. After all, as in the arts, the energy exchange is vital for the creation and that's even more true in fashion and the shoe making art!